EDIT: added perspective on the bandwidth cap. From the time of first connection, the product is valid for 365/185/30 days depending on the subscribed plan. This means that if you get 30 days of service, let it expire, then renew before 60 days have passed, you can continue using the same SIM. After 60 days, you'll need to re-register and wait for a new SIM to be delivered. You cannot connect to other providers or "remote access servers." I guess this means they won't allow VPN pass through, which makes sense if they want to inspect packets. Below are the most important bits. This product is designed for activities such as browsing of text and still images or sending and receiving email. Therefore the streaming of videos or the use of P2P application, etc. will result in bandwith limitation/traffic shaping/network management/your @$$ being throttled. As discussed previously, this was pretty much inevitable. Customers consuming in excess of 3,000,000 packets within three days may experience additional limitations on transfer rate. First, how many bytes is in a freaking "packet?" I absolutely hate the use of the word packet because it is just a way to get around saying up front how much bandwidth costs. Rant aside, I believe 1 packet is 128 bytes. So, 128 bytes * 3,000,000 packets = 384,000,000 bytes. 384,000,000 bytes / 1024 = 375,000 Kilobytes. 375,000 Kilobytes / 1024 ≅ 366 Megabytes. 366 Megabytes / 3 days ≅ 122 MB/day. Exceeding around 100 MB/day for 3 consecutive days will get you temporarily throttled. On the train this morning, I pulled out the back of the envelope and calculated how long you would need to sustain a transfer at the absolute maximum of 300 kbps to hit the cap. In short, it works out to an hour a day for three days. In doing this, I realized that a packet kind of makes since. One packet is exactly equal to one kilobit. But we already know that a sustained stream will activate the rate cap after "a few minutes," so in reality, you would need to do a number of burst transfers each day to hit the average daily maximum of 122 MB. If the cap kicks in after 2 to 3 minutes of streaming, you'd need to do around 20 full-speed bursts per day. I am not a heavy user of packets because I am typically connected to wifi, don't watch youtube videos, and don't have a VOIP app installed. As a result, I typically don't even use half of the 3 million packets mentioned above in an entire month. To prevent spam, TCP(?) port 25 is blocked. Packet inspection. How deep? I should also mention that the Japanese phrasing does not limit the word "analyze." It says analyze, etc. 分析等（ぶんせきとう/ぶんせき など）. This service is provided as "best effort," and the advertised speeds are not guaranteed. In addition, depending on location and signal strength, actual speeds may be reduced. Service may not be available in locations removed from base stations or where structures may interfere with the signal. The provided SIM card remains the property of b-mobile and must be returned upon termination of services. for ~ $15o, I can live with 122 megs a day, but I'll be kinda bummed if it is much less than that. At any rate, even if all I get to do is send txt (email), and use google maps - I think this will have been worth it. It beats the ~$15/mb (or so) T-mo charges for data roaming, and (to me) seems better than the prepaid option with Softbank. That thing seems like an incredibly bad deal. For double the price you could buy an unlimited SIM from Softbank, which (for me at least) averages 1.5mb/s and has none of those nasty restrictions. Why would anyone buy that one? I hope b-mobile will do something fast, I want to trash my old AU keitai! Edited post to add perspective on bandwidth cap. Then we could either start our own MVNO and watch the business grow -- or we could forego the competition and the chance to make a bundle and settle for making our own buyer's club of a mini-MVNO (if the entry fees are low) and each choose our own data plan. There are only a few questions to get answers to to see if this is really workable. The rewards would be great. I don't think JCI offers voice. * Perhaps no MNVO's offer such. I think e-Mobile has what used to be a data plan that they added docomo voice to. * This is weird, if you think about it. JCI is offering something that would have been good with PalmPilots, WindowsMobile, and other PDA's of years ago. Now, who is going to be content with email and a little web-browsing only on a $400-600 smart phone? 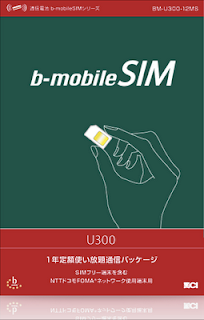 I have trouble seeing JCI's target audience for their b-mobileSIM U300. Maybe they imagine it is for people who use their nice phone primarily around WiFi spots and just do email on the train? It hardly makes much sense. The potential audience is too limited. How do I go about buying one of these data only sim's? I am currently working in Japan on a 90 day business visa (so don't have a gaijin card etc.) Is it as 'simple' as buying the Softbank prepaid card where I only had to provide my passport? or can I buy this thing at a convenience store? My guess is probably not without a gaijin card - but I don't know for sure. I'd have a Japanese speaker call them and ask because the website doesn't say either way. If you have a friend with a gaijin card, you could have them sign up for you. It is not available in stores, only from their online store. Cool - shall give it a shot! Do you know if there are any funny settings I have to apply to the HTC Desire for the B Mobile sim to work?? check the other posts labeled b-mobile here. A reader with a G1 is having no joy getting the b-mobile SIM to work. For android devices, they only officially support the docomo banded magic and xperia. They are also saying that the docomo magic must be running 1.5 to work. I don't understand why the B-mobile U300 SIM can't be ordered from overseas or why it can't be bought at the airport? Otherwise, it would be perfect for me as I will be visiting Japan with an unlocked iPhone 3GS soon. I don't want voice, just data to use email, Safari, Google Maps and Skype. This certainly looks like it targets tourists like me because no Japanese residency documents are required but why is it so hard to get? I guess eBay sellers will have to fill the gap in the market in the same way that they do when I need a local SIM for visits to the United States.